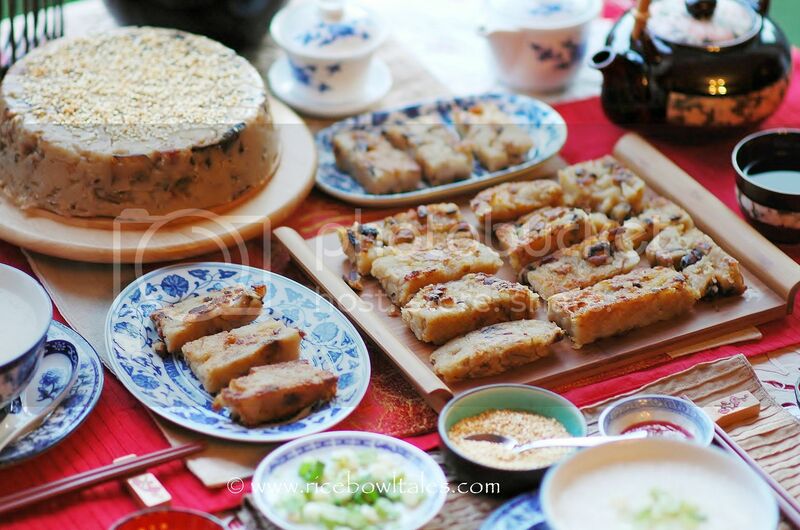 Although as a family, we all like eating Chinese steamed cakes very much; whether it be the Brown cane sugar cake, the Turnip cake, Water chestnut cake or the Taro cake. In spite of this, I've never made them at any other time of year except in the weeks just before Chinese New year. 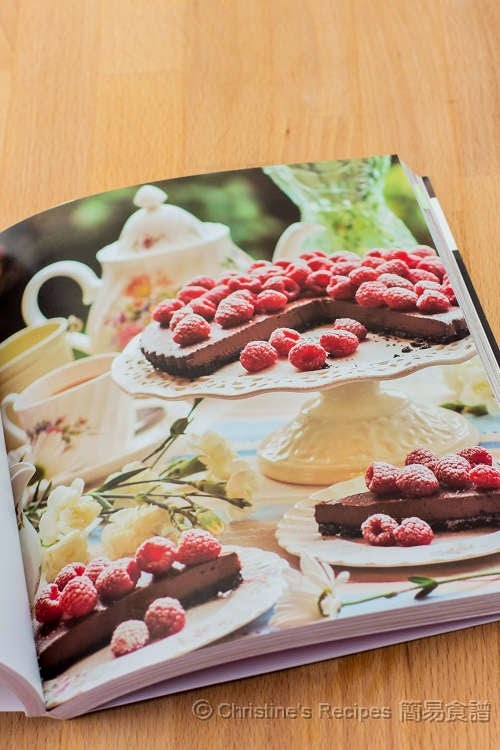 Recently, my husband and my children have been urging me to start making the steamed cakes. Even my friend and my sister-in-law, who aren't normally taken with Chinese New Year cakes, have asked me to bring some when we attend the dinner gathering in the New Year. Their keen interest have made me want to try something different this year. When I was out at the Chinese supermarket, I saw some really nice and seasonal lotus roots. 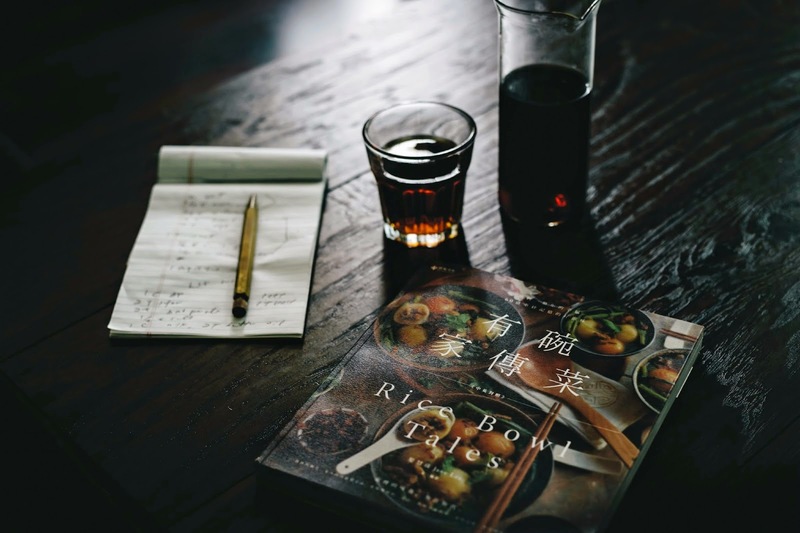 The sight of them sparked a memory I had of reading a post written by the young and lovely and popular blogger Chocolate muimui, about her test tasting a couple of steamed cakes. One of them was Lotus root cake. There are only a handful of other experiences that I can recall having tasted or read about cakes made with lotus roots. 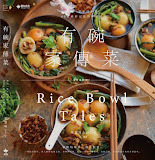 Once was during a summer holiday when I was a teenager; I went to visit my mum's family village in China with her, and my grandmother made a lovely and cool, silky smooth lotus root cake, which I remember fondly to this day. 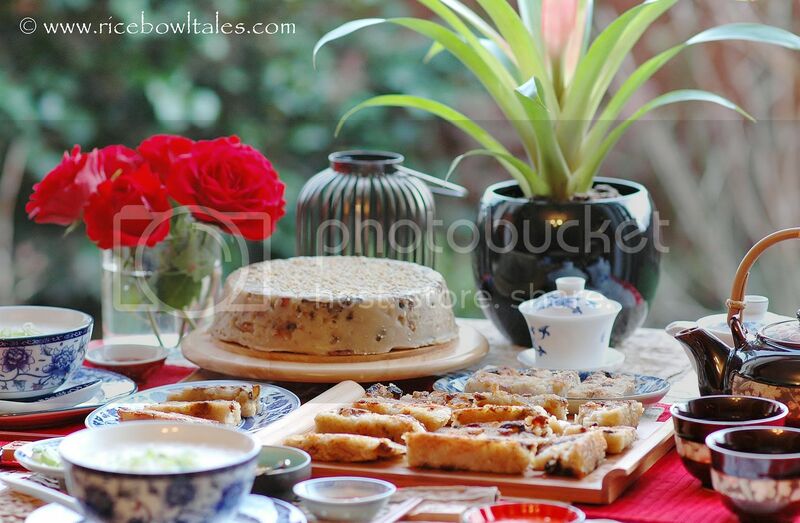 The other times were whenever I read one of the greatest Chinese novels ' The dream of the red chamber'; the part when the 'sweet olive lotus cakes' among other sweet rolls were brought to the old mistress of the house, the descriptions of which always made me so hungry. 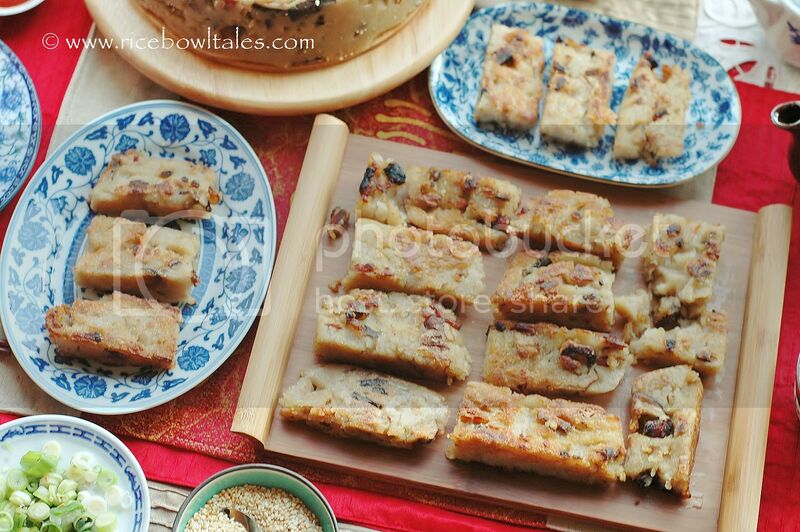 However, despite of my positive recollections, I haven't eaten or read about Lotus root cake in a very long time. So I brought some fresh lotus roots home, planning to make two type of cakes; one sweet and one savoury. Surprisingly, my husband asked me to make the savoury one first. I suspect this is because he likes the preserved Chinese sausage and belly pork which are going to be in the cake. The lotus roots tasted sweet and crunchy after being cooked. I mixed it with Chu Hou paste, five spice powder, shallots, Chinese mushrooms, dried shrimps and the preserved meat together to make the steamed cakes, and lightly pan-fried it on both sides before serving. The tasty and aromatic smell was so delicious. 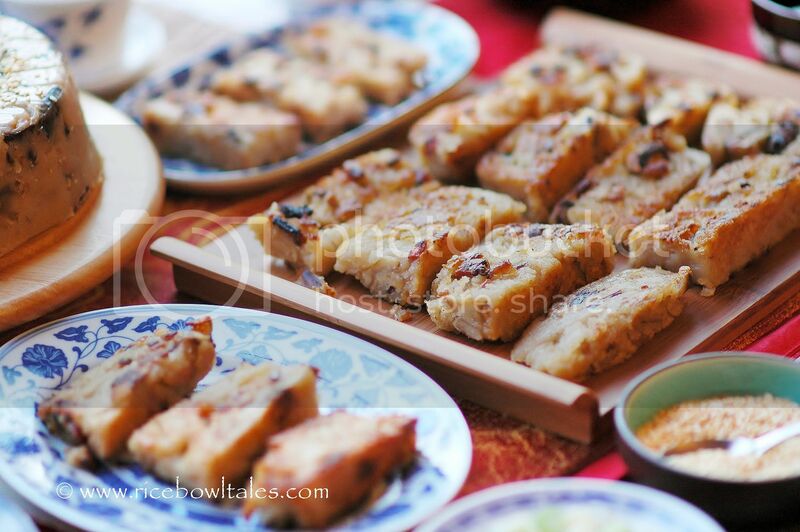 During the Lunar New Year festival, they will be very well received either as celebration food or as a gift. 600g peeled, washed and sectioned lotus roots. Cut lotus roots into 1cm slices, then cross cutting each slice into 1 cm cubes. Put the lotus root cubes into a small pan, covered with water, bring to the boil, then simmer for 5 minutes till soft, rinse with cold water, drained and leave to one side. Trim off the fat from the dried preserved pork, place it into a small pan of boiling water with the sausage to blanch, then cut into small pieces. Soaked the Chinese mushrooms till soft; washed, squeezed the water out and cut into small cubes. Soaked the dried shrimps till soft. Finely chopped the shallots. Heat pan and add 1 tbsp oil, fried the shallots, sausage and pork till soft, then add the mushrooms and shrimps, followed by the lotus roots. Mix in the seasoning and stir - fried everything together for a few minutes until well cooked and seasoned. 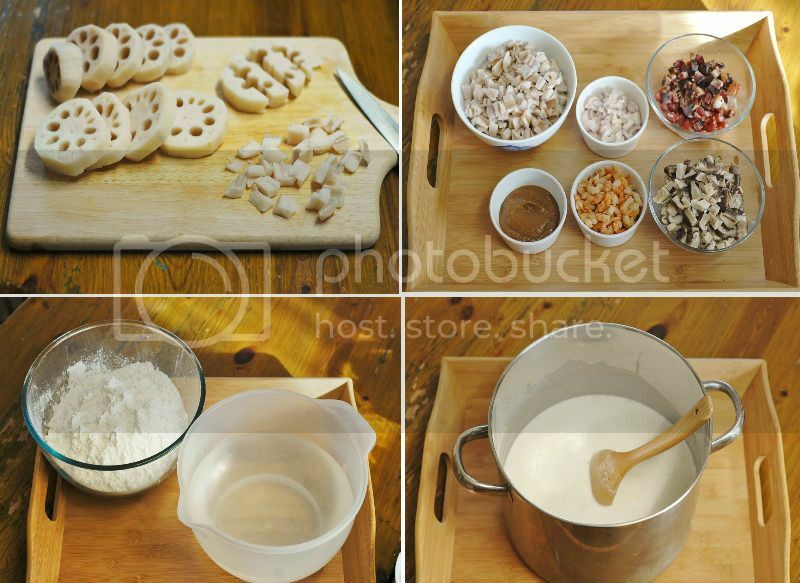 Put all the flour in a big pan, add water, 1tbsp oil and 2tsp salt, stir until the batter are all combined and smooth. Pour the batter into the pan of cooked ingredients, continue to cook on low heat for about 5 minutes so the flour mixture is half cooked. Stir around all the time to prevent it from sticking onto the bottom. Spread the mixture evenly and press down gently into the two lined and oiled tins. Cover with cling film and place in a two tiers steamer on high heat, to steam for 50 - 60 minutes. When insert a chopsticks into centre of the steamed cake, when pulled out quite clean then its cooked. Remove the cling film and allow the cake to cool, before cover the top of the cakes with a large plate each and turn them over. Cut the cake into slices when it's cooled completely. Pan fried lightly on each side, to serve with sesame seeds and sweet chili sauce. The rest of the cakes can be cover and kept in the fridge for about a week. This is the first time that I make steamed cake with lotus root, I'm still yet to find different ways to make it even more interesting. Yes, the texture is the best part of eating this cake, my husband preferred it to the Taro cake. 莎莎作好準備過年發財添丁啦 ~ 呵呵 ~ 恭喜恭喜!! I'm a huge fan of these Chinese steam cakes as well! 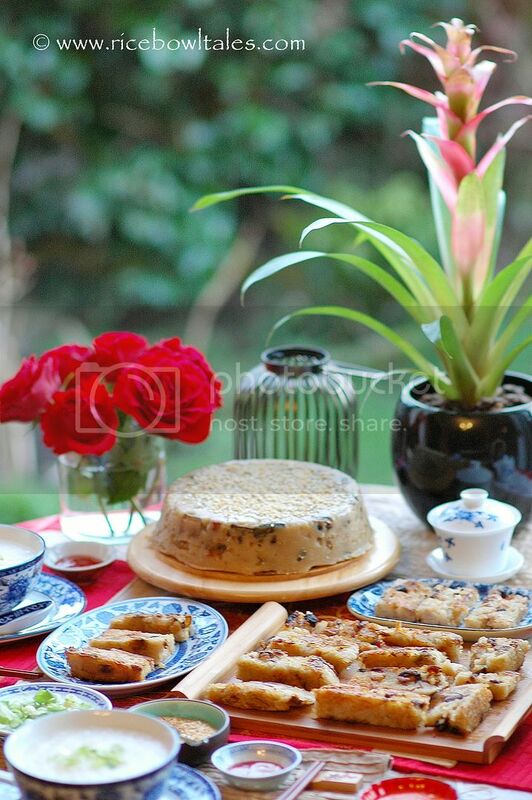 But I've never heard of lotus root cake ;) but I'm sure I would love it as I love lotus root! Yes I know, tell me about it!! I thought it was only me who thinks that and it's because of my age!! To be honest, this's the first time that I cooked a steamed lotus root cake, but it's going to be one of my favourites from now on, it's so much easier to make and tasted so good! I think you would like it too. 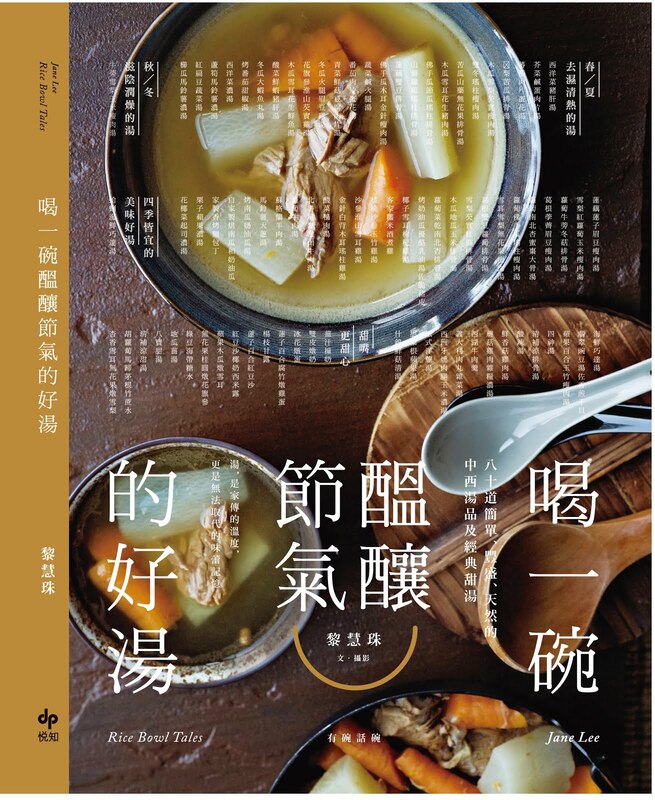 I like yam or radish steamed cake but have never came across steamed with lotus, but I know I will like this too.. 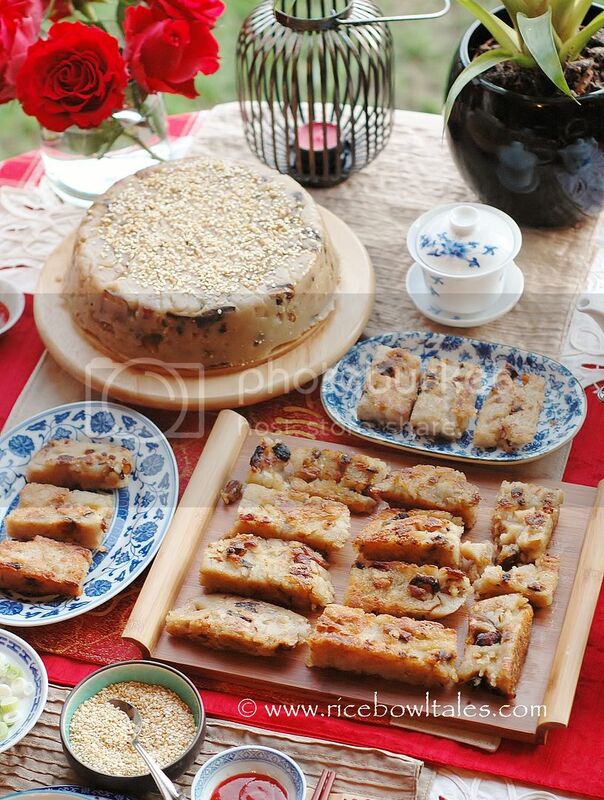 Wow...Very nice Lotus Root Cake! Happy Lunar New Year to you & your family, all the best for the year of snake!